Sitting from left are Eddie Nicholls, Arleigh Rutherford, Shannon Crawford and Nigel Duguid. [www.inewsguyana.com] – Shannon Crawford has returned as President of the Georgetown Cricket Umpires and Scorers Association (GCU&SA). Crawford was unanimously retained as President when the body held its Annual General Meeting at the Clerical and Commercial Workers Union in Quamina Street. International television umpire Nigel Duguid returned unopposed as the Vice-President, while Arleigh Rutherford, who was also unchallenged, will serve as Secretary for another term. Former international umpire Eddie Nicholls and Montgomery Chester were retained as Treasurer and Assistant Secretary Treasurer respectively. Zaheer Mohamed was elected as the Public Relations Officer (PRO), while the committee members are Heuvel Cunha, Ryan Banwari, Javed Persaud and Nolan Hawke. 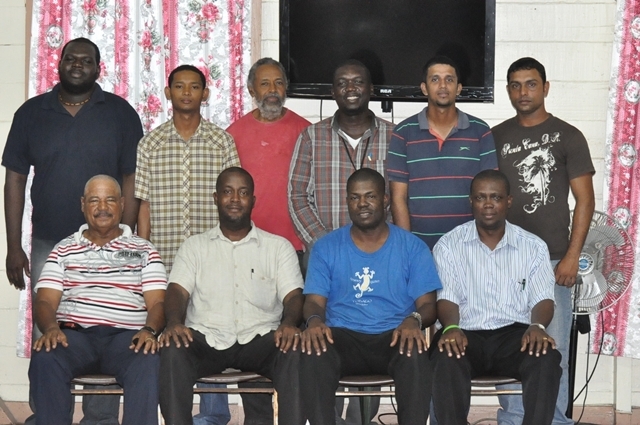 Speaking after the elections, Crawford thanked the members for electing him once again and urged the young umpires to continue training for their remaining exams. PRO Mohamed urged his fellow executive members to work collectively towards the development of the game and to maintain a high level of umpiring. Ronald Williams performed the duties of Returning Officer and was ably assisted by Malcolm Peters.